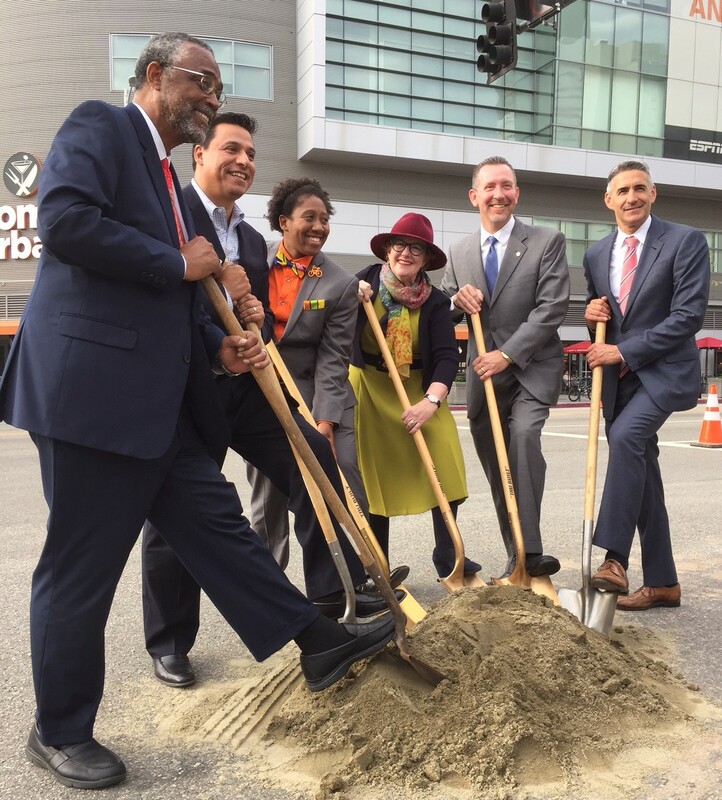 My Figueroa groundbreaking. Left to right are L.A. City Councilmember Curren Price, L.A. City Councilmember Jose Huizar, L.A. County Bicycle Coalition Executive Director Tamika Butler, L.A. Walks Executive Director Deborah Murphy, LADOT Assistant General Manager Dan Mitchell, and Department of City Planning Director Vince Bertoni. Photos by Joe Linton/Streetsblog L.A.
Today city of Los Angeles leaders celebrated the groundbreaking for the long awaited My Figueroa complete streets project. Construction is getting underway this month. The facility is anticipated to open in June 2017. The high profile street makeover will make Figueroa safer, more vibrant, and better for walking, bicycling and transit. My Figueroa connects with numerous high profile destinations, including Exposition Park, the Coliseum, USC, L.A. Trade Technical College, the Convention Center, Staples Center, L.A. Live, as well as Metro’s Blue, Expo, Purple and Red Lines. 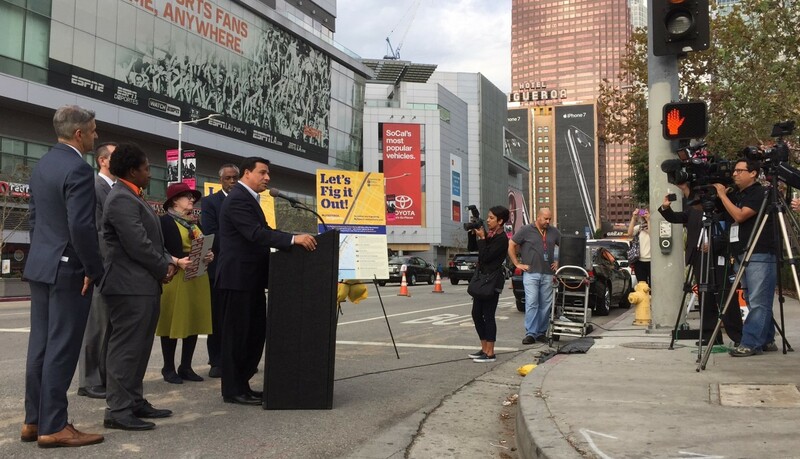 Livable streets champion and Los Angeles City Councilmember Jose Huizar proclaimed MyFig Los Angeles’ “most complete complete street” and emphasized safety and a balance between multiple modes of transportation. Councilmember Curren Price, recalling his recent trip to Germany and Denmark where he witnessed bicycle-friendly streets, declared that “it really does work.” Price mentioned wanting to explore adding protected bike lanes to other streets in his district to make safer streets “for everyone not just a few.” Several speakers alluded to the ups and downs, controversy, compromise, trade offs, and hard choices that My Figueroa underwent. Including funding, planning, a lawsuit, a working group and construction, the project has already taken eight years. My Figueroa will feature three miles of protected bike lanes extending from downtown to Exposition Park. In addition, the project will revamp 11th Street from Figueroa to Broadway, narrowing the roadway to provide ample sidewalks. The project includes landscaping, wayfinding, bus lanes, floating bus stop islands, bike signals, and more. The MyFigueroa project includes three interconnected streets: Figueroa Street, 11th Street and Martin Luther King Jr. Boulevard. Filed Under: Downtown LA, LADOT, MyFigueroa! Curren Price – do you have no shame? We need to stop giving photo ops to non-believers. MyFigueroa does not include protected bike lanes all the way from downtown to Exposition park. The lanes become “buffered” only between roughly Pico and 21st, and south of Expo. The project was significantly watered down since its first iteration. This is cool! I always thought Fig at Ave 56 is bad intersection! Now it’s finally going to be fixed! Yeeeeeehaaawwwwwwww!!!!!!!!!!! Thanks MyFig for doing the right thing! I’m thrilled at more bike infrastructure, but I’m still puzzled by some of the planning choices. There’s also no plan to add bike lanes in both directions between 7th and Olympic, which is one-way northbound on those blocks. It’s wonderful to have this connection between 7th/Metro and the Expo bike path, but you can’t ride it south! I guess that’s what the 11th Street segment is for. This would be fine, since there are bike lanes on Grand in this area. But it’s also northbound only! I always try to figure out where the city wants me to ride and ride there, but this one is a mystery. They’re improving the bike infrastructure on 7th, but where should I go south on 7th to connect with MyFigueroa? Olive has sharrows, but there is so much construction on the street that you’re usually squeezed. Do I have to go all the way over the Main and then take that south to 11th and cross over to Broadway? I just want an integrated set of bike routes. Things are improving, but it’s still a bunch of piecemeal efforts that don’t always link up. Sorry User_1, this project is for South Figueroa, not North Figueroa. Complete Streets for North Fig won’t happen unless Josef Bray Ali gets elected for CD1 in March. $20 Million, and all we get is four blocks of a single one-way protected bike lane? Shammas Group / Downtown L.A. Motors with the help of CM Price seem to have effectively killed any hope of Los Angeles getting a curb-protected bike lane of significant length. These paint lanes (as described on the MyFigueroa web site) will effectively become auxiliary car lanes whenever traffic backs up around Staples Center, the Convention Center, USC and the Colosium. And this is Los Angeles’ boldest move to create Complete Streets? Ohhhhhhh…….. watdahell are we working on South Fig for? North Fig is where infrastructure is needed! I thought MyFig was doing what was needed. My bad! Did Joe get a new camera? The lead pic is pretty sweet. Cool project but doesn’t go far enough. Let’s hope Curren Price is serious when he says he wants more protected lanes. Can his office identify some corridors they want to explore? The man might have had a Road to Damascus moment but I won’t hold my breath. We already had to stomach Koretz’s disgusting WeHo bike lane photo op. What’s next, Cedillo riding primary down Fig flipping off Metro buses?